The Swedish 16-year-old carried a sign reading «Join the Climate Strike,» which she showed the Pope after he greeted her. 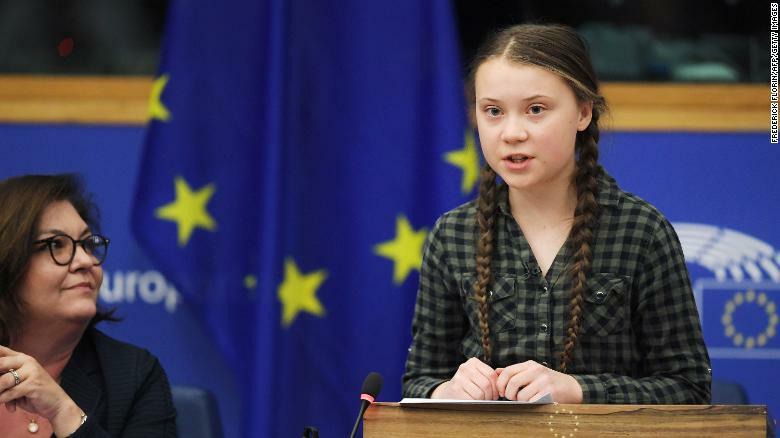 A day earlier, Thunberg urged European Union leaders to «panic» about climate change, as she addressed a committee of the European Parliament in Strasbourg, France. She went on to condemn politicians for spending their time «arguing about taxes or Brexit» in the face of a building climate crisis. Thunberg, whose sit-ins outside the Swedish parliament inspired students worldwide to hold school strikes demanding climate action, spoke to a «packed» room of EU politicians, according to the AFP news agency. «If our house was falling apart, you wouldn’t hold three emergency Brexit summits, and no emergency summit regarding the breakdown of the climate and environment,» she added, to applause from the committee. Speaking in Brussels in February, Thunberg said the European Union must double its targets for cutting greenhouse gases to 80% from 40% by 2030, according to AFP. In January, she gave a speech at the World Economic Forum in Davos, Switzerland, telling political and business leaders that they were to blame for the climate crisis.